PDF archive of Spanish Revolution, a newspaper published in New York by United Libertarian Organizations, a coalition of anarchist groups. Published 1936-1938, it reported on the Spanish revolution and the working class's attempts to introduce libertarian communism in Spain. Scanned by libcom.org following being given to us by an anonymous donor, who would like to thank. These are scanned photocopies, from which occasionally one or two lines are missing from pages, and one or two pages are missing, but apart from that this is a complete archive with every issue ever published, in two volumes. Presented below in four separate PDF files for ease of downloading. Following the outbreak of the Spanish Civil War and revolution in July, 1936, the need was felt for an English-language publication in the United States to present the positions and reflect the ideals of those fighting in Spain for a new revolutionary society. Fascism in its various forms was dominant in Germany and Italy and was threatening in several other European countries, including France. Its most active opponent at that time appeared to be Stalin's Russia, which posed as the champion of freedom and democracy and the only alternative to fascism. Many people of good will throughout the world, suffering through the Great Depression, bewildered by the rightist propaganda and the demagogy of Stalinism, were turning with hope towards Russia. Anarchists had long realized that between the two totalitarian solutions there was little or no real choice. For them the revolution in Spain was a new opening in the direction of freedom. Russian policy at that time was based on the formation of Peoples' Fronts in all countries. This meant alliances with such diverse elements as Chiang Kai-shek, Franklin D. Roosevelt, Fulgencio Batista, Leon Blum, and Francisco Largo Caballero, and a denial of revolution everywhere including Spain. The Communists claimed that in Spain there was purely and simply a civil war between democracy and fascism, and that to work for a social revolution was "counter-revolutionary." Libertarians felt that the message of Spanish anarchism should be made known to the world, Its relative isolation had to be broken down in order to offset the vicious propaganda of the Communists, the half-truths and distortions of the press agencies, and the clouds of confusion emanating from the chancellories of the Western democracies. Maximiliano Olay, the representative in the U,S. of the National Confederation of Labor (CNT) of Spain, left his job as a professional translator in Chicago, moved to New York, and opened an office on lower Fifth Avenue. An additional delegation of three representatives of the CNT then arrived from Spain to stimulate interest in the libertarian point of view and to seek support in the American labor movement. At that time the anarchist movement in the United States consisted of a number of groups largely organized around foreign language newspapers and having but minimal coordination of activities. On the initiative of Olay, it was decided to establish an ad hoc organization, the United Libertarian Organizations, to publish Spanish Revolution. 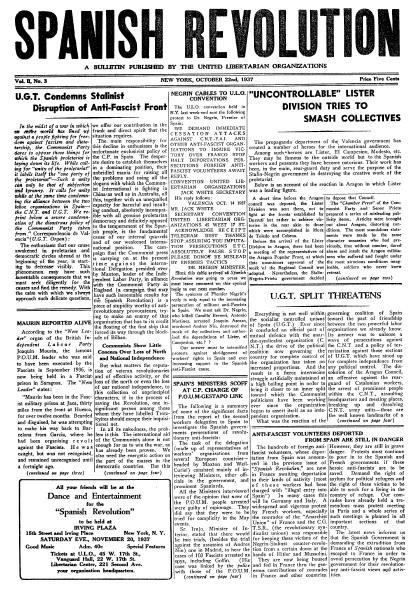 The United Libertarian Organizations embraced the Jewish Anarchist Federation (publishers of Freie Arbeiter Stimme), the Russian Federation (Dielo Trouda), the Vanguard group, several branches of the Industrial Workers of the World (IWW), a federation of Spanish-language groups publishing Cultura Proletaria, Carlo Tresca’s group publishing the Italian newspaper Il Martello several Canadian anarchist groups, some Italian groups in New England, and a scattering of others. Although not actually affiliated, the Gillespie, Illinois, branch of the Progressive Miners of America contributed substantially through a regular monthly assessment on its membership. Mass meetings were held in many cities and thousands of dollars were collected, all of which was sent to the Spanish movement with no deductions for overhead expenses. The editorial in the issue of September 5, 1936, expressed the hope among many radicals throughout the world that a new revolutionary center was in the making in Spain, where the presence of a mass anarchist movement would be able to prevent any party from monopolizing the course of developments as had happened in Russia, where the revolution degenerated as a result of the Bolshevik dictatorship. Spanish Revolution consistently reflected the activity and thinking of the Spanish libertarians. Its editorial line reflected the hopes and policies of the Spanish movement. However, at times these policies were contradictory, reflecting disagreements within the CNT itself. To everyone who at the time followed the Spanish events, and especially for those of us who personally lived the exciting, hectic, thrilling, and frustrating days in Spain, a reading of these pages brings alive once more the great aspirations, hopes, and heartbreaks of an earlier decade. The Spanish workers, with more than a half-century of revolutionary indoctrination and struggle behind them, saw themselves on the threshold of victorious social revolution. The liberal republican politicians had failed to prevent or stop Franco's revolt, and those places where the latter had failed. were mainly the result of the action of the working-class in defiance of the established authorities. The governments of Madrid and Barcelona had virtually ceased to exist. They were replaced at every level by revolutionary committees in a confusion of colors and shades. Out of the apparent chaos, the libertarian forces of the National Confederation of Labor (CNT) and the Iberian Anarchist Federation (FAI) took gigantic steps towards the organization of a society based on freedom, justice, and mutual aid. To the extent of their influence over large areas (and in some they were the majority force), both industry and agriculture were collectivized and/or socialized. The Socialist workers in many sectors participated actively and loyally in this revolutionary work. In those early days, within the anti-fascist half of Spain the middle-class liberals had resigned themselves to accepting (in effect if not in so many words) the revolutionary transformation of Spanish society. Only one political sector — Stalinism — actively opposed the revolutionary road. The Communists standing at the extreme right in the anti-Franco coalition denied that there was a social revolution and did everything possible to block it. They entrenched themselves by appealing to the capitalist and petty-bourgeois elements, recruiting thousands of the latter into their party, and into "unions" and auxiliary front groups to serve their purposes. From a small minority party they became a powerful movement. Eventually they were able to crush the revolution, largely through political and military blackmail. Stalin's Russia sent in a limited amount of supplies, always paid for in gold in advance, and on condition that Stalinist policies be followed. Their personnel flooded Spain. Starting with technicians and advisors, they shortly introduced the GPU and its methods of terror against the revolutionary movement. The libertarians were no match for the bolsheviks in political intrigue. For the sake of a false unity against fascism, the libertarians yielded one revolutionary position after the other until the revolution was lost. And with the revolutionary fervor gone, the military fight against Franco (an unequal one at best) was also lost. In its earlier issues, Spanish Revolution followed quite closely the line of the CNT It published the official documents and policy papers of the Spanish organizations and it emphasized the positive economic and social achievements of the libertarians in the revolution — and these were many and impressive. In a sense, however, its hands were tied, and it glossed over the lack of revolutionary intransigeance in such matters as the reluctant acceptance of the "militarization" of the Workers' Militias and the anarchist entry into the governments of Spain and Catalonia. Soon, however, the editors of the paper found it impossible not to criticize their Spanish comrades. In the issue of January 8, 1937, Emma Goldman attacked the softness of the anarchists in yielding to the Stalinist pressure and political blackmail. Other material in the same vein is to be found in succeeding issues, and there is a rising tone of criticism. The Stalinists were attacked head-on for their policies of strengthening the revivified capitalist state, for their opposition to the revolution and their attempts to liquidate its achievements. They were attacked for their reorganization of the repressive police forces and for their campaign against the "semi-Trotskyist" POUM (Workers' Party of Marxist Unification). In their attacks on the counter-revolutionary policies of the Communists and their sharp criticism of the capitulatory policies of the CNT organizations, the editors of Spanish Revolution were actually echoing many dissident militants and groups within the Spanish libertarian movement. The Libertarian Youth Federation, the Friends of Durruti, and several important groups of the Iberian Anarchist Federation were doing the same thing in Spain. For the remainder of its period of publication, Spanish Revolution reported step-by-step the unfolding of events, the developing political crises, and the barricade struggle of the May Days, 1937, in Barcelona. The latter marked the last point at which the Stalinists could have been crushed and the revolution possibly saved. After the May Days, the Largo Caballero Government was overthrown by the Stalinists and replaced by the Government of Juan Negrin. This regime, heralded as the "Government of Victory" by the Communists and by itself, proceeded to lose the war piecemeal, due largely to the demoralizing effect of its anti-revolutionary policies on the morale of a revolutionary people. Upon taking power, Negrin crushed the POUM and brought its leaders to trial as fascist agents, just as many of the Old Bolsheviks in the Soviet Union had been framed and liquidated by Stalin, accused of being Hitler's agents. The Russian GPU operated actively and almost openly in Spain. Andres Nin of the POUM and many anarchists as well as a number of foreigners of anti-Stalinist Marxist groups, were murdered by its agents. The CNT now went into open opposition where it was joined by the Left Socialists around Largo Caballero. The repression reached mammoth proportions. The press censorship was crippling and the anarchists and socialists issued illegal papers in order not to lose their identities altogether. The Stalinist International Brigades were taken into Aragon to smash the peasant collectives by force of arms. Spanish Revolution had been founded to bring the message of the revolution to the Anglo-American people. As the revolution declined and news became increasingly unfavorable, the enthusiastic support that had made its publication possible petered out. Spain and the World, published in London, filled the need for further information in the English language. J. Garcia Pradas, La Traicion de Stalin (New York; "Cultura Proletaria," 1939). Spanish Revolution ceased publication in the spring of 1938. The Negrin Government was firmly in power and the revolution was over. The counter-revolution was triumphant. The war dragged on as a purely military affair for another year. Hitler and Mussolini had made their point. So had Stalin. Less than six months later, the Stalin-Hitler Pact was signed and World War II was launched. Grateful acknowledgement is made to Sam Weiner who was active in the United Libertarian Organizations, for his help in gathering the data for Ibis introduction. Excellent. Glad to see this up. Aside from the stuff on Spain, I find the little ULO announcements to be of interest. They give you a flavor of their trials and tribulations at trying to gain support for the CNT/FAI/AIT....... they had a tough go of it. The comrades, as they must have been in England, were simply out resourced by the Popular Frontists/Republicans/Stalinists. Spanish Revolution Bulletin (by ULO, New York, 1936-1938) The "Spanish Revolution" A Bulletin published by the United Libertarian Organisations (ULO) around Maximiliano Olay (New York 1936-1938, 36 issues). 2nd edition Greenwood Prints, 1968. (There was as well a publication by supporters of the POUM in New York with the titel 'The Spanish Revolution' edited by Lois and Chales Orr, with 17 issues between 21.10.36 and 19.05.1937, see here: http://www.marxists.org/history/spain/index.htm ). *"Spain and the World" a newspaper around Vernon Richards and Freedom Press in London, between 11.12.1936-23.12.1938, 47 issues were publised. Followed by "Revolt!" with six issues from 11.02.1939 to 03.06.1939. A selection of articles from 'Spain and the World', appeared by Freedom Press, London 1990 with the book title: "Spain 1936-1939: Social Revolution - Counter Revolution". Spanish Revolution Bulletin by the United Libertarian Organisations (ULO). Ein Verzeichnis frei zugänglicher digitalisierter anarchistischer Zeitschriften/Zeitungen im Internet by the Bibliothek der Freien (Berlin) - a list of digital aviable anarchist magazines and newspapers"